Thinking About Food: Spring is here! Mmmmm just love fresh asparagus. So very versatile. That would be in the Waikato, a good green grocer near the uni where I am every Wednesday!!!! Its only $8.99 kilo too which for new season is amazing!!!! I love asparagus wrapped in parma ham and then roasted, yum! 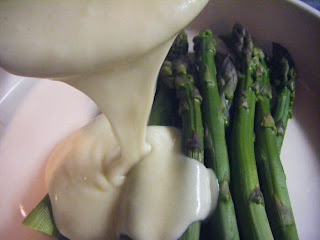 Yours looks so good covered in cheese sauce, bliss! Kerry (Me and My Three) reminded me of roasted asparagus too the other day......that is a real favourite, I LOVE it!!!! 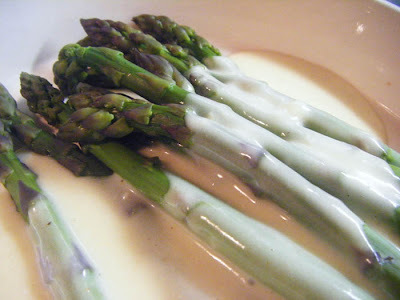 I adore asparagus and this looks so yummy! No way you are in the Waikato? Oh me too. Ok, well I haven't seen it yet but the Big Cow on the main road from TA to Hamilton has a promising sign saying "Asparagus coming soon". Might have to take a trip over the uni way to grab me some asparagus! Yes, I frequent the vege shop by the Warehouse on Clyde St- small world isnt it!!!!? Gosh yes. For some reason I thought you were much further down the line. Well, I work at the hospital so it is kind of on my way home in a round about sort of way!! I saw my first asparagus of the season in Woolies today. Big fat juicy looking spears - YUM. I like to blanch it and put chunks in a mixed green salad. It goes especially nice with avocado and strawberries would you believe. Too bad it's only Aussie strawberries in store right now.